Huh. Bellicose means the opposite of what I thought it meant. To me, it sounded round, lazy and immobile, perhaps indifferent or apathetic, but it actually means aggressive or antagonistic. Merriam-Webster: favoring or inclined to start quarrels or wars. Online Etymology Dictionary: early 15c., from Latin bellicosus “warlike, valorous, given to fighting,” from bellicus “of war,” from bellum “war,” Old Latin duellum, dvellum, of uncertain origin. 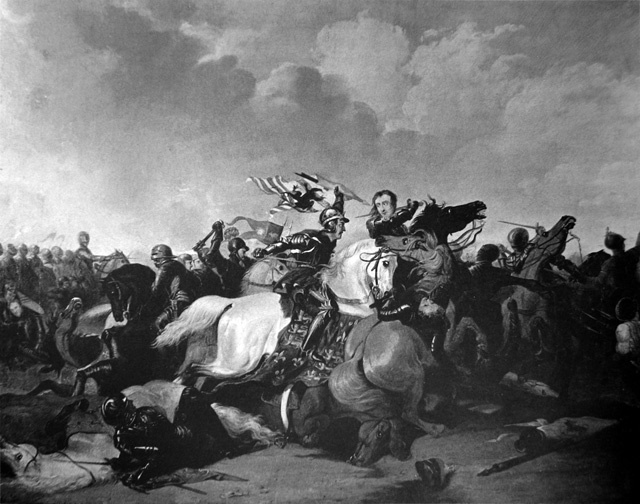 I’ve used a drawing (engraving maybe) of the Battle of Bosworth Field (1825) by Abraham Cooper (1786–1869). It depicts Richard III and Henry Tudor (Henry VII) engaging in battle; I think that Richard III is very worthy of the term bellicose.